In a suspected case of witchcraft that left villagers in Lalapansi in a state of shock, a 48-year old man had his hut gutted by a mysterious fire while his clothes were burnt to ashes, but the wooden wardrobe they were in remained intact, police confirmed. Police in the Midlands province identified the victim as Mr Casper Bowas Dube. The Midlands police spokesperson, Inspector Patrick Chademana said the odd incident occurred on Monday at Village Five - Ifafa Farm, near Sino â€“ Zimbabwe in Lalapansi. He said Dube suspected his fate originated in Botswana where he met a fellow Zimbabwean friend. "One Casper Bowas Dube went to Botswana and in April 2006, he bought a motor vehicle from the alleged N'anga, but failed to pay the balance. In December 2006, Dube then came back to Zimbabwe and built three huts at village 5 Ifafa resettlement and gave one hut to his father," he said. Insp Chademana said trouble hit Dube on Monday when one of his huts caught fire while he was inside. "A mysterious fire which Dube suspect is from his friend he met in Botswana then gutted his hut on Tuesday while he was inside, but he escaped unhurt and managed to remove his property with the assistance of other villagers," said Insp Chademana. He said on 5 April 2008, Dubeâ€™s clothes that were inside the wardrobe caught fire and were burnt to ashes. "What is queer about the incident is that the wooden wardrobe in which the burnt clothes were in did not catch the fire," he said. The unusual characteristics of this fire are similar to spates of fires that have been raging in various parts of the world, all caused by an ultra low-frequency infrasound resonance. In myriad recent cases of this kind, standing waves of infrasound have caused the heating of metals, which then ignite any flammable objects in contact with the metal. In some cases metal car doors have ignited their plastic framing, and in this case in Lalapansi, the flammable clothing was likely ignited by heated metal hangers upon which they hung. 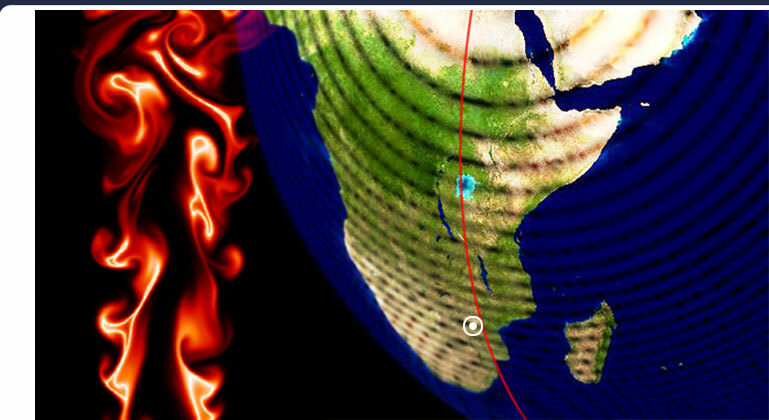 The infrasound standing waves causing these types of fires are focused by the Orion pyramids of Giza, Egypt, which is 3,390 miles from Lalapansi, Zimbabwe (19.33Â°S 30.18Â°E). This distance is 13.61% of the Earth's mean circumference distance of 24,892 miles. The pyramids of Giza are due North along the 30th longitude, showing this area of Lalapansi to be in exact alignment with the south faces of the ancient pyramids. This infrasound resonance will be growing erratically in relation to the increasing solar activity and requires the complete evacuation of these focal areas. Other affected areas in this region include Mapuve and Bodibe, South Africa. Babura, Nigeria has also been greatly affected in western Africa. In various other cases, vibrating cellphones and shavers have spontaneously ignited by this same effect, as reported in Vallejo, California; the Berici Hills of northern Italy and in Messina, Sicily. Other infrasound focal points include Ratria, India; Seattle, San Mateo and Santa Barbara, USA.